LEARNING LIBRARY: ANTERIOR CERVICAL DISCECTOMY AND FUSION (ACDF): WHAT IS IT AND IS IT RIGHT FOR ME? What is an ACDF procedure? Anterior approaches, such as in ACDF, involve less muscle stripping from the spine and allow good access to the discs at the front of the spine compared to a back (posterior) approach. It provides the physician with a direct approach to the cervical spine, and patients tend to have less incisional pain from this approach. Download the Anterior Cervical Discectomy & Fusion Patient Education Brochure to learn more about this procedure and what to expect before, during, and after surgery. Is an ACDF right for me? In the cervical spine, surgery is often performed via an anterior approach to address a multitude of issues, including degenerative disorders, fractures, or tumors. 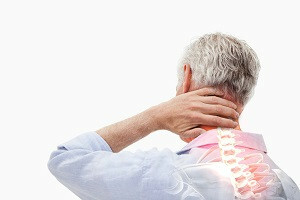 Your physician may determine that an ACDF procedure is a good option for you if you require an interbody fusion, are skeletally mature, and have gone through six weeks of non-surgical treatment. Conversely, your physician may determine that an ACDF procedure is not a good option for you if you are not a good candidate for fusion surgery in general due to other medical conditions. These conditions can be signs of inflammation or infection near the operative site, patient sensitivity to implant materials, patients with inadequate bone quality, and other indications. All surgery presents risks and complications that are important to discuss with your physician prior to your surgery. Listening to your physician’s guidance, both before and after surgery, will help to ensure the best possible outcome from your procedure. Some risk associated with anterior cervical surgery of the spine may include: cervical edema (swelling); dysphagia (difficulty swallowing); dysphonia (difficulty talking); hoarseness; vocal cord paralysis; laryngeal palsy; sore throat; recurring aspirations; nerve deficits or damage; tracheal, esophageal, and pharyngeal perforation; airway obstruction; deficit or damage to the spinal cord, nerve roots, or nerves possibly resulting in paralysis; dural tears or leaking; cerebrospinal fistula; discitis, arachnoiditis, and/or other types of inflammation; loss of disc height; loss of proper curvature, correction, height, or reduction of the spine; vertebral slipping; scarring, herniation, or degeneration of adjacent discs; surrounding soft tissue damage; spinal stenosis; myelopathic, or radicular symptoms; spondylolysis; otitis media; fistula; vascular damage and/or rupture; and headache. Please contact your physician to discuss all potential risks. In addition to consulting with your physician and medical teams, it often helps to speak to someone who has been through the procedure. To connect with a Patient Ambassador who has already had an ACDF procedure, please complete our request form. While this website provides information about many different non-surgical and surgical options, it is not meant to replace any personal conversations that you should have with your physician or other member of your healthcare team. Not all the information here will apply to your individual treatment or its outcome. The information is intended to answer some of your questions and serve as a guideline for you to ask your healthcare team appropriate questions about the procedure. I’m scheduled for a 2 level acdf Nov 21. I have a herniation at c5-c6 and curve reversal at c4-c5. The pain over the year has diminished, no more sharp shooting pain. Still have some pain in shoulder, bicep, and thumb. I’m able to work, and do most things. Trying to figure out if I should really go through with the acdf. Worried about being in more pain or worse off than now.